Fall is in full swing, and the holiday season is rapidly approaching! If you’re like us, you know now is a great time to make sure your hair is on it’s “A” game to take you through the season. 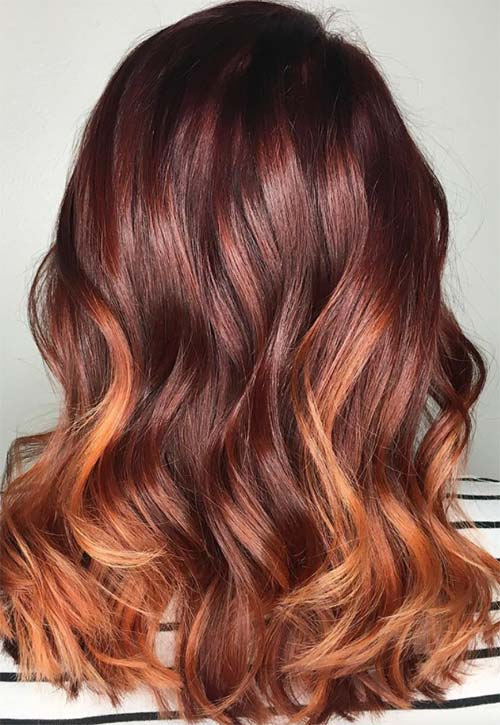 To help inspire you before your next appointment, we thought we’d take some time and talk about a super hot hair color trend that first made its appearance last fall: the “Fallayage”. Say what?! You read that right, the Fallayage is like your favorite balayage but with warmer richer tones for Fall. Just like the balayage you’re used to, Fallayage is also done freehand as opposed to foils. For brunettes, we recommend Autumn tones such as auburn, golden browns and even copper to warm up your natural color. For blondes, try adding some sand, strawberry, or honey shades. The idea here is to warm up the hair as the cooler temps take over outside. Going warmer in the fall is a great choice because usually by now our summer tans are fading and our hair might need to recover a bit from being exposed to the sun and heat. This Fallayage is the perfect way to create dimension and shine while allowing our hair to recover from our summer fun. Are you ready to try out a hot new Fallayage this season? Come see us at Von Anthony Salon! Our professional stylists will help you select a new complementary color that will turn heads this holiday season. Call us at 972.731.7600 to schedule your appointment or take advantage of our mobile app to schedule at your convenience. Download it for free from iTunes, Google Play, or Amazon.